This year for Thanksgiving we went to Amsterdam. I think it is our favorite city in the world. I won't go into why here, but suffice to say we had a fantastic time. 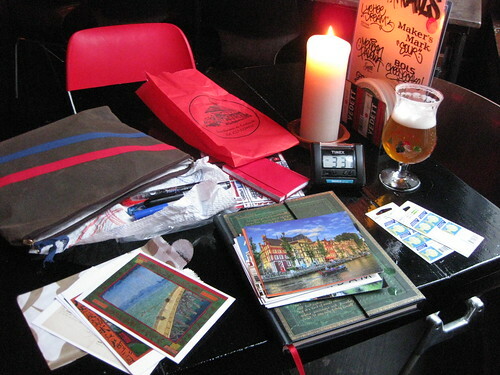 Of course I sent postcards, and had an awfully fine time writing them in various wonderful Dutch bars. Pictured above and below is my favorite bar, a haunt right down the street from where we stayed (and we went there every single night! ), Gollem Proeflokaal. 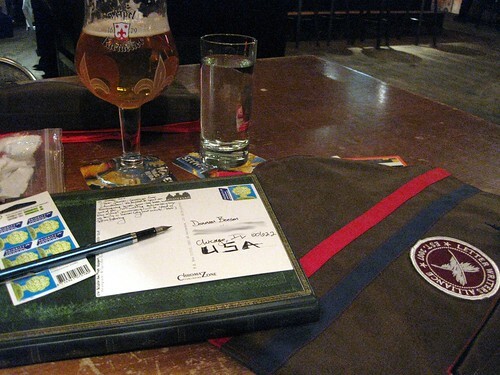 Another bar where I wrote postcards, Parck, was an "American style" bar, but I didn't even know that until I looked up their website just now! 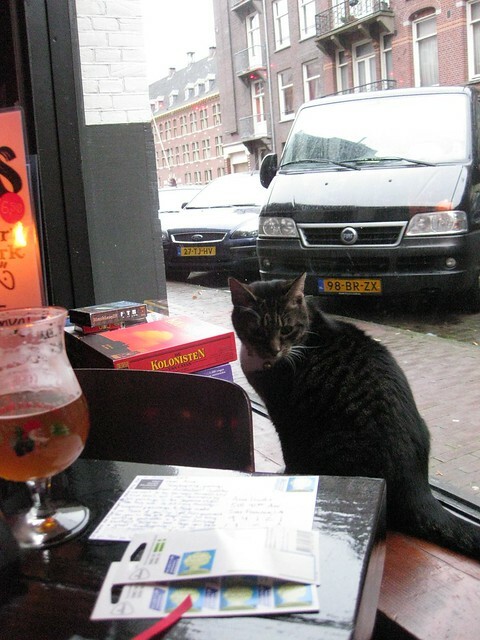 The bar cat here was friendlier - I was about the only person in the place at this time - and she came up and was very interested in my postcard writing. She helped, for sure. 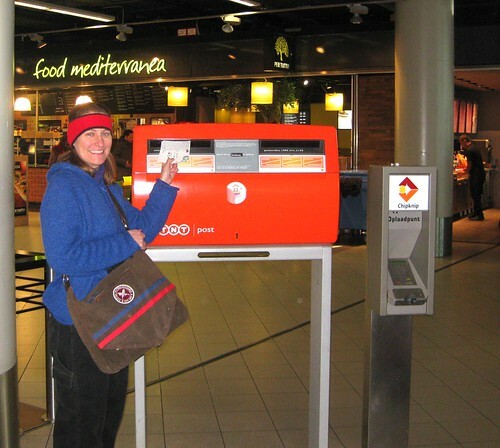 I forgot to get my picture taken when I mailed postcards from other mailboxes, but the very last batch went out at the airport, and I remembered to ask for a photo then. I had no idea I was matching my Letter Writers Alliance bag so well, with my blue sweater and red earwarmers. Incidentally, the LWA member bag (sorry, it really is for members only - but if you're reading this blog, why aren't you a member of the Letter Writers Alliance?!?) is my new favorite travel bag. I have carried it on trains, planes, in cars, and it's been all over the world now. It's a darn fine bag. So that was my trip, my postcard fun, and why I've been a little absent lately. Now I'm home, in my very busy season at work, but I'll have a brief respite the second half of December so I do hope to have some more blog posts coming. November has not been a good month for blogging or for mail, but it's been a fine month for travel and adventure! What fun!!! Thanksgiving in Amsterdam? Terrific idea. 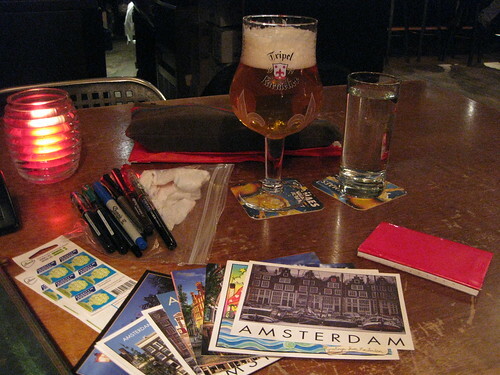 Writing postcards in Dutch bars? Fabulous. Beer? Why not? And the LWA bag looks great. Love the shot of you mailing the cards......very fun post. Love it! This is awesome. 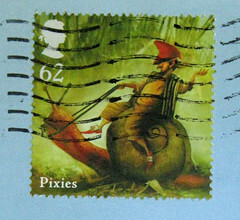 Making mail in other countries is so exciting! Tripel Karmeliet is a belgian strong beer and indeed one of the best ones we have. I'm glad the bartender didn't serve you Heineken !! The bartender was a real class act - I don't think they had Heineken in that bar, either. Thanks for the great info on Tripel Karmeliet! I see that you were using what looks like a Platinum Preppy Pen with the barrel filled completely. Can you share more about your experience with with this pen? I have purchased multiple sets and the ink tends to go through the barrel too quickly or leaks. I like to have multiple colors on hand at a time;) I have traveled with them as well and it seems the pressure of the plane might have also made them explode a bit. I have tried it sans plane trip as well. I am in love with this pen and use scented ink with them. I like light weight see through fountain pens. Love to hear your thoughts from one letter writer to another on how yours seemed to stay intact. Miss Monogram - it's called an eyedropper conversion, and Platinum Preppies are famous for this. Your question is so excellent, and I just got into writing so much about it, that I'm actually going to do a blog post and explain it in-depth. Thanks for post, it's really interesting to read. I want to ask you about transport from Amsterdam Airport. Should i book taxi in advance via http://kiwitaxi.com/Netherlands/Amsterdam+Airport+Schiphol on i could rent a car right there for few weeks? Hi Norman, glad you like the post. I really can't answer your question about transport. I've never rented a car in the NL, nor have I taken a taxi because public transport there is outstanding. I always take the train from Schiphol to Amsterdam.